In a medium saucepan bring the water and rice to a boil, reduce heat and simmer for 10 minutes. Drain. Meanwhile, while the rice is cooking, melt the butter in a medium skillet. Add the onion and cook until tender. Stir in the garlic and cook for 1-2 additional minutes, until fragrant. Remove from heat and add the whipping cream, hot sauce, Swiss cheese, salt and pepper. Add the rice and mix well, place in a greased 2 quart baking dish. Bake at 350 degrees covered for 45 minutes. Uncover and bake an additional 10 minutes until top is beginning to brown. 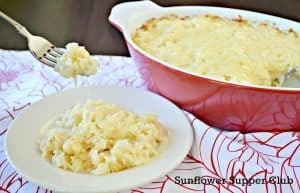 I’ve linked this recipe to the Church Supper hosted by Everyday Mom’s Meals.